What do you estimate is your overall patient “no-show” rate? The role of healthy meibomian glands in promoting successful contact lens wear should not be underestimated. While there is redundancy in this lipid producing system (30-40 glands per eyelid), it is critical that a certain percentage of them maintain their function in order to promote a healthy lipid layer. If you are not already, you might consider looking at some of the new technologies that have come on the market that can help you assess or express these critical glands. Visionary Optics, the manufacturer of the Jupiter and Europa brands of scleral contact lenses, announced their newest design, the Elara scleral Lens. The Elara scleral design offers a prolate geometry to fit the “regular cornea”. The Elara scleral features are designed to provide essential hydration, comfort and vision. The Elara scleral lens is indicated for patients with ocular surface disease, with or without a dry eye component, and patients who have failed with traditional GP or soft lenses, especially if they have astigmatism or high refractive error. The Elara scleral lens is fit utilizing a 12-lens fitting set. All lenses will offer Visionary Optics’ 90 day unlimited warranty. Dr. Stephanie Woo will be hosting a webinar discussing prescribing scleral lenses for the regular cornea and the Elara scleral design on Tuesday, April 14, 2015 at 9pm Eastern time. For additional information on their scleral lens designs, contact Visionary Optics at 1-877-533-1509 or visit www.visionary-optics.com. The Contact Lens Association of Ophthalmologists (CLAO) and the Contact Lens Society of America (CLSA) are holding an educational program on Saturday, May 2, 2015, at the Warwick Hotel in Denver, CO. Entitled the Contact Lens Educational Summit: Exploring New Heights in Contact Lens Management, this one-day educational program will cover the latest developments in the areas of Dry Eye, Presbyopia, Scleral Lenses and Topography. Courses have been submitted to CME, CE, NCLE and JCAHPO for consideration. For more information and to register visit www.clao.org. Immediately following this program is a complimentary non-CME program developed by the CLAO Journal Editorial Group, (Eye and Contact Lens) entitled Myopia Epidemic and Myopia Progression. For more information and to register visit www.clao.org. The TFOS DEWS II Steering Committee will meet on March 31st in San Francisco to finalize the DEWS II mission and subcommittee topics, select the workshop participants from all nominees, establish detailed objectives, and decide upon a timeline. The members of Steering Committee are: Chair - J Daniel Nelson, St Paul, MN; Vice- Chair - Jennifer Craig, Auckland, New Zealand; Organizer - David A Sullivan, Boston, MA; Esen Akpek, Baltimore, MD; Dimitri Azar, Chicago, IL; Carlos Belmonte, Alicante, Spain; Anthony Bron, Oxford, UK; Janine Clayton, Bethesda, MD; Murat Dogru, Tokyo, Japan; Harminder Dua, Nottingham, UK; Gary Foulks, Louisville, KY; José Gomes, Sao Paulo, Brazil; Katherine Hammitt, Washington, DC; Juha Holopainen, Helsinki, Finland; Choun-Ki Joo, Seoul, Korea; Zuguo Liu, Xiamen, China; Jason Nichols, Birmingham, AL; Kelly Nichols, Birmingham, AL; Gary Novack, San Rafael, CA; Virender Sangwan, Hyderabad, India; Fiona Stapleton, Sydney, Australia; Kazuo Tsubota, Tokyo, Japan and James Wolffsohn, Aston, UK. More information will be available soon via: http://www.tfosdewsreport.org. The TFOS Board wishes to thank the following sponsors, whose generous contributions to date have made this sequel, TFOS DEWS II, possible: Title Sponsor: Alcon; Platinum Sponsor: Shire; Gold Sponsor: Allergan; Silver Sponsor: Bausch + Lomb; Bronze Sponsors: Akorn, Dompé, Horus, Oculeve, TearLab and THEA and Sponsor: Senju. On March 17th optometry in Mexico took a firm step forward. The President of Mexico signed into law a modification of Article 79 of the Health Act that adds optometry to the list of health professions that require a university degree in order to practice. The amendment will apply to all new graduates. According to the Mexican Institute of Geography and Statistics visual impairment is the second most frequent disability in the country. Per a release from The World Council of Optometry and Optometry Giving Sight, it is estimated that 43% of the Mexican population need optometric services and that the country requires approximately 12,000 optometrists to satisfy the existing demand. At the moment the fifteen universities offering the optometry degree graduate an average of 400 optometrists each year. The World Council of Optometry and Optometry Giving Sight have been supporting Mexican optometry through advocacy and promoting the development of human resources. Both organizations are part of a coalition to establish the first school of optometry in Southern Mexico – one of the most deprived regions of the country. CareCredit and VSP Vision Care (VSP) announced an exclusive agreement to help VSP members increase access to financing for quality eye care and optical products at thousands of participating VSP network providers. Through the agreement, the two organizations will partner together to educate VSP’s nearly 70 million members and CareCredit’s nine million cardholders about options for managing eyecare expenses for a range of lifestyle choices, including glasses and contacts, sunglasses, specialty sport and other customizable eyewear. They will also work to connect members and cardholders with the providers who accept CareCredit in the VSP doctor network. VSP will work with its network of 32,000 providers to add the CareCredit credit card as a payment option and to educate its patients about the benefits of CareCredit. This image shows total epithelial defect after alkali burn. The cornea was copiously irrigated immediately after the injury. Unfortunately the patient developed scleral ischemia with progressive stromal melting. A corneal transplant was performed three weeks later. We thank Boris Severinsky for this image and we welcome photo submissions from our other readers! 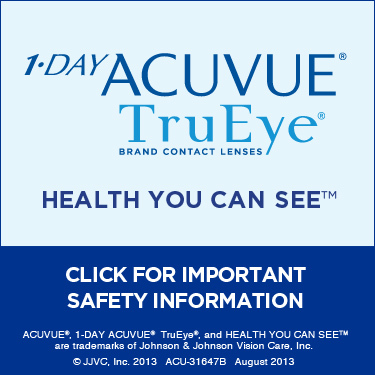 It is easy to submit a photo for consideration for publishing in Contact Lenses Today. Simply visit http://www.cltoday.com/upload/upload.aspx to upload your image. Please include an explanation of the photo and your full name, degree or title and city/state/country. I love yoga – the breathing practice with movement is an important part of my week. I can tell you about the many ways yoga helps me. A study in the January 2015 issue of Ocular Surface gives me one more positive result of practicing yoga – or at least the breathing part of it. The results of a small Japanese study of 20 healthy women demonstrated that after 3 minutes of abdominal breathing (a specific ‘belly’ breathing technique that involves inhaling for four seconds and exhaling for six), compared to that before breathing, the tear meniscus volume increased significantly (measured 15 minutes after deep-breathing) in study subjects.1 Furthermore, systolic blood pressure showed a significant decrease immediately after abdominal breathing. The authors suggest that the slow, mindful breathing might help to restore autonomic control and, in turn, improve the volume of tears. How great is that? It is easy, drug-free, quick and free! Note that there was no increase in tear volume immediately following or 30 minutes after the abdominal breathing, so it will be interesting to see what new information develops in this area. Until then, added to lid hygiene and omega 6/3 supplementation, deep breathing is on my practice list for dry eye patients! Sano K, Kawashima M, Ikeura K, Arita R, Tsubota K. Abdominal breathing increases tear secretion in healthy women. Ocul Surf. 2015 Jan;13(1):82-7. doi: 10.1016/j.jtos.2014.08.002. Epub 2014 Oct 16. A review of publications primarily in the peer reviewed literature was recently conducted to evaluate the efficacy of contact lens strategies in the management of myopic progression in children.1 According to the authors, the inclusion criteria stipulated publications of clinical trials evaluating the efficacy of CLs in regulating myopia progression based on the primary endpoint of changes in axial length measurements and published in peer-reviewed journals. Other publications from conference proceedings or patents were exceptionally considered when no peer-review articles were available. The authors stated that “the mechanisms that presently support myopia regulation with CLs are based on the change of relative peripheral defocus and changing the foveal image quality signal to potentially interfere with the accommodative system.” Ten clinical trials addressing myopia regulation with CLs were reviewed, including corneal reshaping treatments (orthokeratology), peripheral gradient daytime wear contact lenses, and daytime wear bifocal (dual-focus) and multifocal lenses. The authors concluded that CLs were reported to be well accepted, consistent, and safe methods to address myopia regulation in children. They stated that corneal reshaping is at present the modality with the largest volume of accumulated evidence relating to the efficacy to regulate myopic progression in children. However, factors such as patient convenience, the degree of initial myopia, and non-CL treatments may also be considered. The combination of different strategies (i.e., central defocus, peripheral defocus, spectral filters, pharmaceutical delivery, and active lens-borne illumination) in a single device will present further testable hypotheses exploring how different mechanisms can reinforce or compete with each other to improve or reduce myopia regulation with CLs. Myopia management is taking a more prominent and important role in clinical eye care practice for many practitioners. The rates of myopia throughout the world are increasing at alarming rates. Based on an article published in Archives of Ophthalmology in 2009, here in the United States myopia prevalence has increased by about 68% when we compare prevalence findings established in the 1970s to the 1990s and there was a dramatic increase (8X) in the prevalence of high myopia (-8D and greater).2 The implications of myopia are significant. There is a dramatic influence on quality of life, economic burden, productivity and independence. However, we are becoming more aware of the ocular health risks of myopia (especially high myopia) regarding glaucoma, retinal disease, and of special interest – myopia related macular degeneration. Today we have multiple tools at our disposal to manage myopia progression that all are evidence based. They include corneal reshaping treatments, the use of pharmacological agents such as various concentrations of atropine and the use of peripheral defocus design multifocal daytime wear contact lenses. There is now a dramatic paradigm shift in our approach to myopia in children. Some of us have already incorporated this into our practices and others are just beginning to get on board. I think the time is here and our approaches are evidence based – let’s not just “compensate” for myopia, let’s manage it. 1. González-Méijome JM, Peixoto-de-Matos SC, Faria-Ribeiro M, Lopes-Ferreira DP, Jorge J, Legerton J, Queiros A. Strategies to Regulate Myopia Progression With Contact Lenses: A Review. Eye Contact Lens. 2015 Feb 13 [Epub ahead of print]. 2. Vitale S; Sperduto RD; Ferris III FL. Increased Prevalence of Myopia in the United States Between 1971-1972 and 1999-2004. Arch Ophthalmol. 2009;127(12):1632-1639. The objective of this study was to assess the bioburden in an orthokeratology contact lens (OK) care system (defined by microbial identification from OK case fluid) and to identify the risk factors causing high bioburden for pediatric OK wearers in southern Taiwan. A prospective study for the investigation of bioburden in the OK care system was performed in a tertiary medical center in southern Taiwan. Microbial isolates from the case fluids soaking OKs were analyzed, and pathogenicity was determined. Age, gender, OK experiences, and contact lens care habits were considered the potential risk factors of microbial bioburden (colony-forming units per milliliter) for causal analysis. Forty-one OK wearers (20 female and 21 male subjects) participated in this study. The mean age was 12.7 years, and the mean OK-wearing experience was 3.5 years. A total of 86 microbial strains were isolated from 38 culture-positive specimens. Frequently reported pathogens in contact lens-related microbial keratitis were less common in the current study, but still present, including four strains (5%) of Serratia marcescens, one strain (1%) of Pseudomonas aeruginosa, and one strain (1%) of Staphylococcus aureus. Microbial bioburden of the OK care system was significantly higher (P<0.05) in male subjects. The authors concluded that the contamination rate of the OK care system was high, and many isolated microorganisms had potential pathogenicity. Reinforcement of proper contact lens care and education should be mandatory for OK wearers, particularly for male subjects, to decrease the risk of high bioburden of the OK care system. © 2015 PentaVision LLC All Rights Reserved.